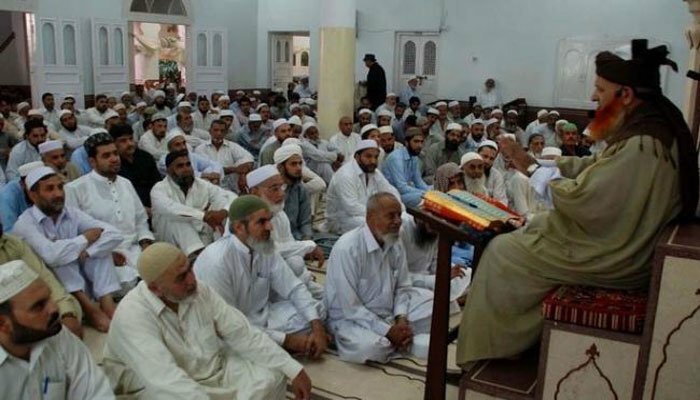 LAHORE: Noted scholar Dr Khalid Zaheer has suggested that state of Pakistan should take control of what should be preached from the mosque pulpits and who should do it to check the growing extremism. The scholar cited examples of Muslim countries like Malaysia and Saudi Arabia where the states were in charge of mosque pulpits and managed to control the content and mannerism of the sermons delivered by clerics which eliminated the emergence of opposing interpretations of Islam. He was replying to the participants during the question answer segment at the end of the session titled ‘Jihad and Dawah’ on the second day of ThinkFest, the Academic Literary festival here Sunday. The guests at the session were Dr Samina Yasmeen, from UWA, Australia, eminent jurist Salman Akram Raja, and Islamic scholar Dr Khalid Zaheer. Journalist Ejaz Haider was the moderator. The title of the session ‘Jihad and Dawah’ was basically drawn from the book penned by Dr Samina Yasmeen which is a research primarily focusing on the activities of Pakistan’s famous religio-jihadi group Jamaat-ud-Dawah (JuD) and its once-patronised Kashmiri freedom group, Lashkar-e-Taiba (leT). Dr Khalid Zaheer said the Muslim state should ensure what content and interpretation is preached from the mosques and podiums, and held that no interpretation of Quran and Hadith could be called hundred per cent accurate. He said preachers have large number of followers ready to lay down their lives on their commands. Dr Samina delved on her research in the book which showed that JuD and LeT were launched in the wake of Soviet invasion in Afghanistan and drew popular public support by carrying the slogans of Jihad and Dawah. She said people rallied around them after listening to the interpretation of Surah Al-Tauba from the Holy Quran which calls for believers to wage jihad against the infidels who were belligerent. Citing her research, Dr Samina said first phase of JuD and LeT was that of Dawah and Jihad which began during Soviet invasion underlining that Islam was in danger and Jihad was imminent. There was a major shift during the second phase that came after 9-11 during which main focus was on Dawah but jihad was to be waged simultaneously. She said after Mumbai attacks in 2008, JuD came under immense world pressure and changed its stance by referring to “Sabr-e-Jameel’ which called for believers to calm down with patience and wait for the time when you regain power. During this phase, JuD involve women and children as political activists and its Dawah carriers. Salman Akram Raja Advocate differed from the two panelists on the notion that extremism and sectarianism emerged from illiteracy and poverty, saying that preachers generating such ideas were educated and the society in general and their audience in particular had an understanding of the ideas and notions. He said simply increasing literacy and reducing poverty was no solution to the problem. He said interpretation of Surah Al-Tauba of Holy Quran forms the basis of the entire movement against the belligerent infidels since it calls for jihad against them, adding that Dr Khalid Zaheer and Dr Javed Ghamidi have quite different interpretation of this Surah.